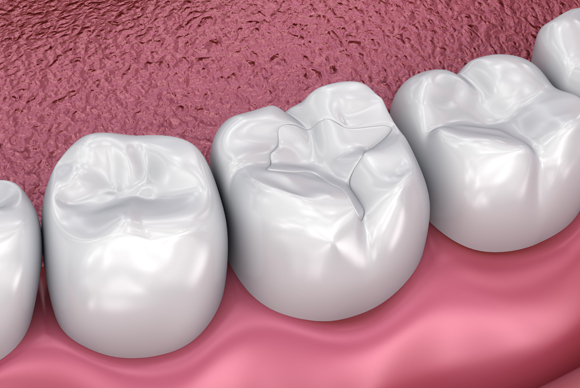 If you look at your back teeth in the mirror, you will see the grooves/fissures on them. The grooves can be deep and small, making it difficult to clean with your toothbrush at home causing it to stain or sometimes decay. Fissure sealants are designed to fill in those pits and grooves on your biting surfaces to prevent decay developing. It is a tooth-colored or white plastic material paste, which is applied directly into the grooves and set by ultraviolet light. Once set, the fissure sealant is not visible to the eye when you talk or smile. Fissure sealants are most effective within 18 months of permanent adult teeth eruption, as bacteria can easily set into and decay the new life tooth. Therefore, this management is ideally suitable for kids and teenagers, the age group with a higher prevalence of decay (from tooth eruption). However, adults can also benefit from the protective layer as well. The sealant can last a few years, depending on the food you eat -hard and sticky foods can wear off the sealant; good care will prolong the sealant. Thus, it is important to have regular dental check-ups with us to top up the sealant and protect your teeth from decays and diseases.